The Mustang HPP will make its official debut this week at the New York International Auto Show, and the timing will not-so-coincidentally mark the 55th anniversary of the original Mustang, the ’64-1/2 model debuting at the New York World’s Fair on April 17, 1964. The HPP picks up a number of Mustang GT features, including the rear spoiler and brakes. 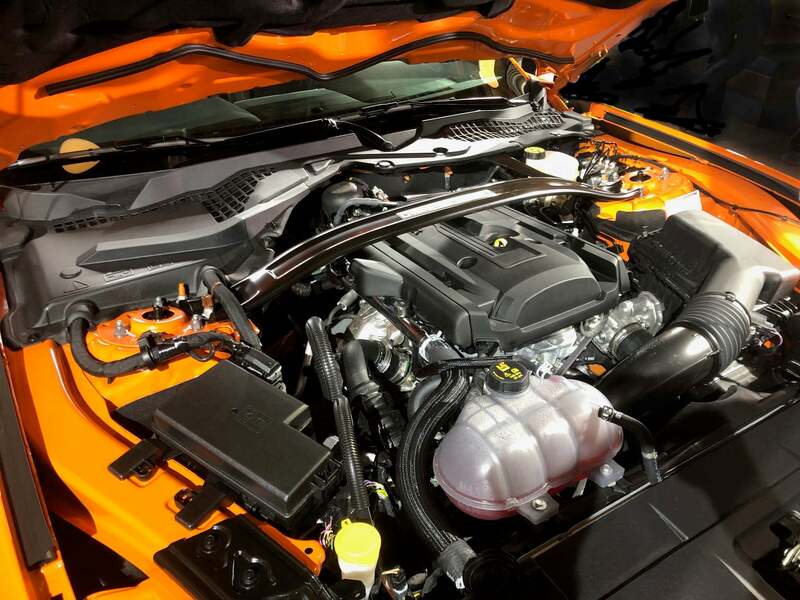 The High-Performance Package happened almost by accident, the Mustang engineering team deciding to transplant one of the 2.3-liter engines being produced at Ford’s Valencia, Spain plant into the pony car. Though essentially the same as the EcoBoost engine already in use in the Mustang, the Spanish plant also produced a version of the four-cylinder engine that uses hardened materials in the block and cylinder head allowing for higher turbo boost. The Mustang with the HPP option gets a 5% larger 63-millimeter twin-scroll turbo compressor and a larger radiator. The engine can be paired either with Ford’s new 10-speed SelectShift automatic or a 6-speed Getrag manual transmission. The HPP uses an engine imported from Valencia, Spain, a beefed up version of the standard Ecoboost 2.3-liter inline-four. The High-Performance Package is more than just an engine upgrade. 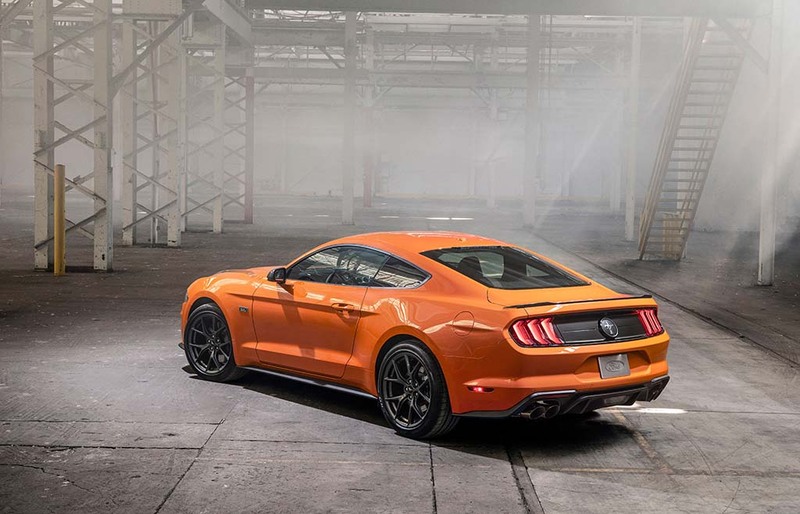 Ford lifts a number of other features from the familiar Mustang GT, including bigger brakes – 352 mm rotors up front, with four-piston fixed calipers, and 330 mm rotors in the rear. The special package also features aero modifications up front, such as its big splitter, to improve high-speed downforce. Add the Mustang GT’s rear spoiler and big Pirelli tires. To further enhance handling, the HPP checklist includes a front tower brace and revised suspension tuning. There’s an even more robust handling package that can be checklisted, though it is only available with the Mustang fastback body. As with the Mustang GT, the handling package adopts the Magneride suspension which uses a special, magnetically controlled fluid that can shift each individual damper from its softest to firmest setting in the time it takes the vehicle to travel two inches at 60 mph. 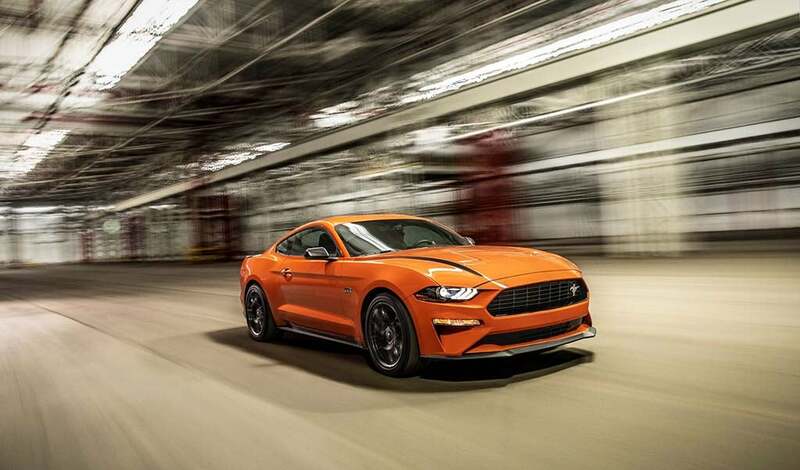 Surprisingly, Ford expects the Mustang High Performance Package will match the fuel economy of the standard 2.3-liter EcoBoost model, 21 mpg City, 31 Highway and 25 Combined. Ford will announce pricing closer to the car’s on-sale date which is expected to be sometime in late summer or early autumn. This entry was posted on Monday, April 15th, 2019 at and is filed under Asia Pacific, Auto Shows, Automakers, Automobiles, Business, China, Europe, Events, Executives, Ford, Markets, Muscle Cars, NAFTA, New York, Personalities, Sales, Sales, South America, U.S./North America. You can follow any responses to this entry through the RSS 2.0 feed. You can leave a response, or trackback from your own site.